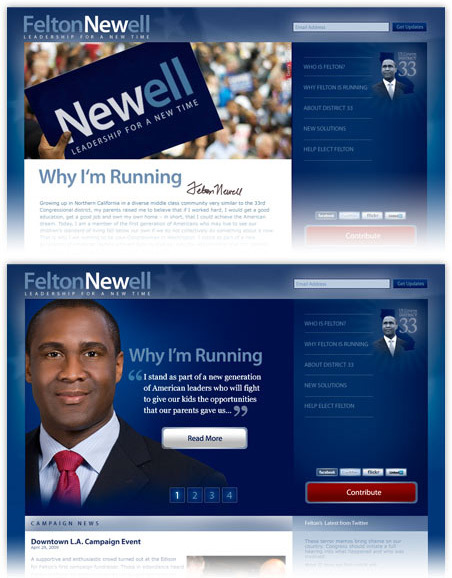 Develop a logo identity system and web site for a US Congressional campaign. These must convey the themes of generational renewal and change that form the foundation of the candidate’s campaign. 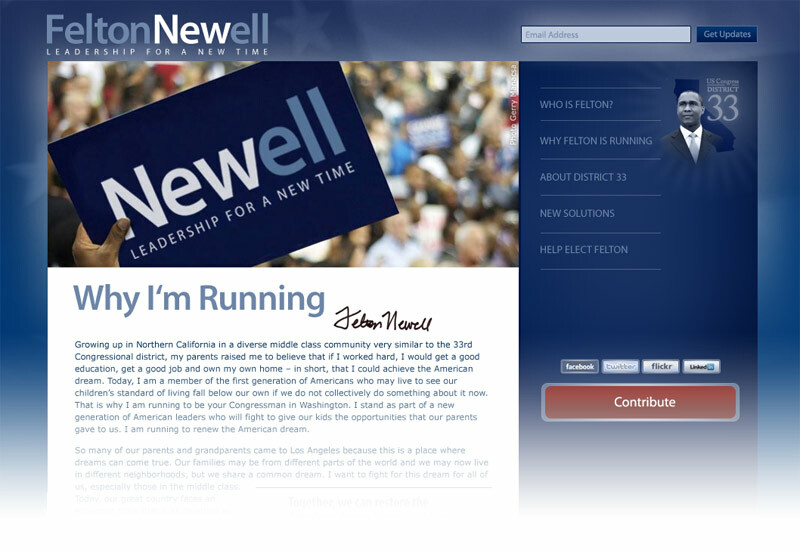 The candidate’s message is reflected by a contemporary aesthetic which retains connections to a venerable progressive political tradition as well as the dynamic threads of California culture. Colors are drawn from an updated Democratic theme developed by the Obama 2008 campaign, reinforcing the associations with change, but using typography that creates a loose association with California companies known for innovation and independent thinking. The general feel is intended to be very contemporary and forward thinking but still substantial, upright and strong. 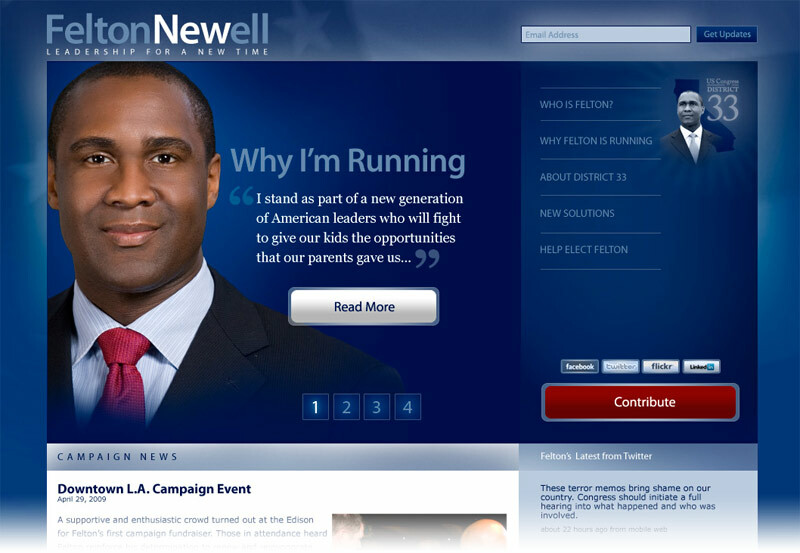 The core message of new leadership is literally embedded in the candidate's identity. 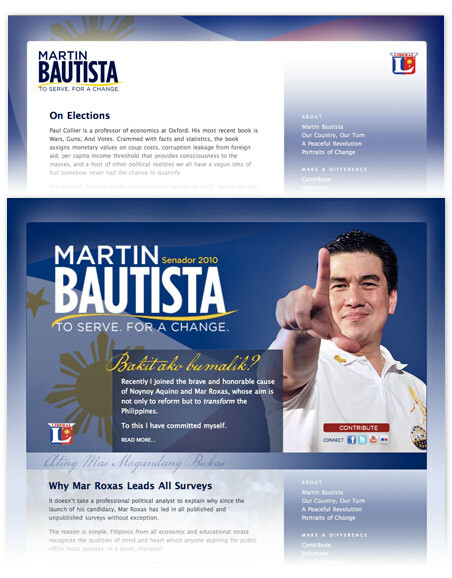 Develop a logo identity system and web site for a national senatorial campaign in the Republic of the Philippines. The campaign wants to convey progress and positive change, while still honoring the country's traditional cultural values. The campaign is also recalling the empowering message of the 90s People Power revolution in which ordinary people brought change after a long period of repression and stagnation. The site was to be developed very quickly with low maintenance requirements to reflect a short campaign timeline and constraints in campaign staffing. The site was developed in the Wordpress CMS for ease of use and familiarity for the candidate and staff. The complete package was designed, developed and delivered within a two-week window. 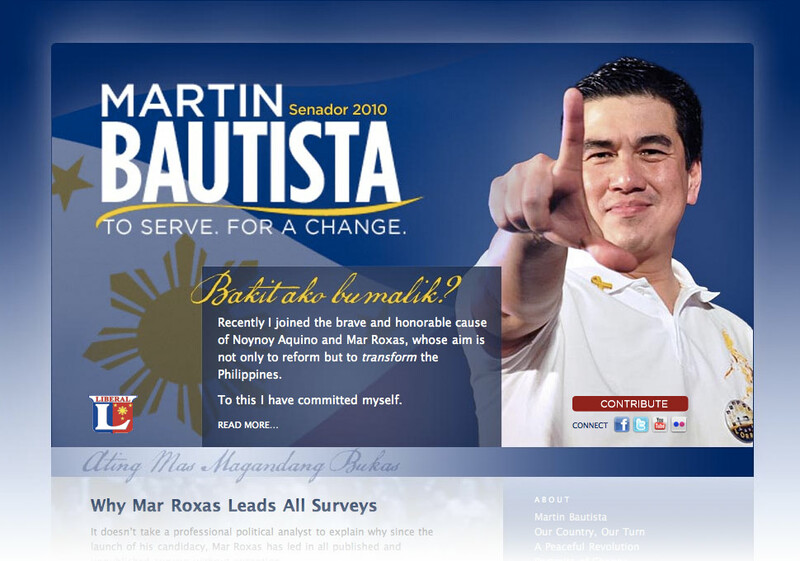 The site theme prominently displays the Philippine flag, a symbol emphasizing the candidate's pledge to put the country first. The bold contemporary aesthetic — in a color echoing the deep blue of the flag — is balanced with prominent Filipino-language headlines in a more-traditional, handwritten script. The logo is also in a strong, contemporary style, but with a prominent ribbon threaded into its structure in the bold yellow that has become a powerful cultural symbol representing reform and change. The tagline conveys a dual meaning indicating in one interpretation the promise of service and change, and on the other, a message of contrast against a class of previous elected officials who are widely seen as self-serving and corrupt. 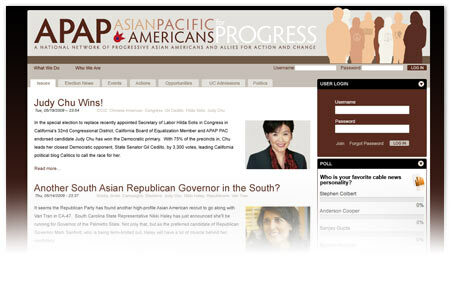 Develop the identity banner and skinning theme for a grassroots political action organization. The site theme celebrates the cultural and ethnic diversity of the organization, reflecting the many hues of its members. Silhouetted figures (drawn from a photo at an organization event) sport subtle iconic representations of key issues, evoking the group’s progressive agenda as well as the ubiquitous t-shirt-style messaging of the target 18–34 demographic. The title banner integrates an existing logo and presents the organization with a contemporary and multifaceted type treatment—composed of many individual pieces but united in common purpose. The overall site is presented within a serious and polished color scheme intended to convey both substance and style.